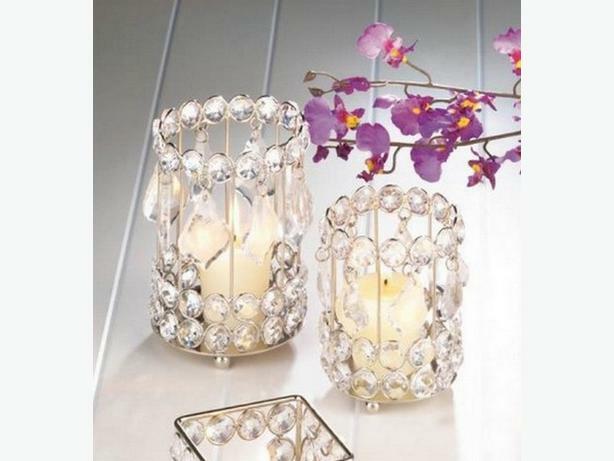 Create a dramatic lighting effect & increase the glamour factor in any decor with these gorgeous candleholders. Faceted crystals, framed in silver metal make any space shine in style with or without a candle while the gorgeous faceted clear gems that dangle from the top reflect the candlelight in total amazement. You get 2 of each (candles not included)...large is 4" x 4" x 5.25" tall & the smaller size is 3.12" x 3.13" x 4" tall! Be sure to check my other listings for a beautiful beautiful assortment of crystal candleholders!